The new TEC Business Intelligence Buyer’s Guide, aimed at business owners, managers, and decision makers, explores powerful business intelligence (BI) technologies that are helping organizations better analyze their data to improve decision-making and organizational performance. 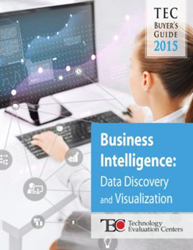 The TEC 2015 Business Intelligence Buyer’s Guide focuses on data discovery and visualization solutions. “The data discovery and visualization techniques covered in this guide allow companies to turn their data into knowledge to ultimately transform that knowledge into better business decisions.” -- Jorge Garcia, TEC Principal BI and Data Management Analyst. TEC is pleased to announce the publication of its latest software buyer’s guide, focused on business intelligence (BI) software solutions. The TEC 2015 Business Intelligence Buyer’s Guide: Data Discovery and Visualization, written by TEC Principal BI and Data Management Analyst, Jorge Garcia, explains the concept of data discovery and visualization, looks at its history and development, and examines software solutions that allow companies and organizations to generate—and interact with—visual representations of the data they collect. The Business Intelligence Buyer’s Guide looks at the individual components of data discovery and data visualization solutions, and software comparison charts of the features and functions of data discovery and visualization solutions currently available on the market. It also features a comprehensive software vendor directory, white papers on the subject, and case studies that look at how companies are benefitting from the use of data discovery and visualization solutions. The TEC 2015 Business Intelligence Buyer’s Guide: Data Discovery and Visualization includes a comprehensive product comparison chart displaying the top BI software solutions for data discovery and visualization, an exploration of current technology trends, and a range of real-life case studies that highlight customer successes from leading software providers including Dundas, GoodData, IBM and Qlik. To download your free copy of the TEC 2015 Business Intelligence Buyer’s Guide, visit http://www.technologyevaluation.com/research/TEC-buyers-guide/TEC-2015-Business-Intelligence-Software-Buyers-Guide-Data-Discovery-and-Visualization.html. For more information on TEC’s software evaluation and selection services, contact +1 514-954-3665, ext. 404, or e-mail selectionservices(at)technologyevaluation(dot)com.